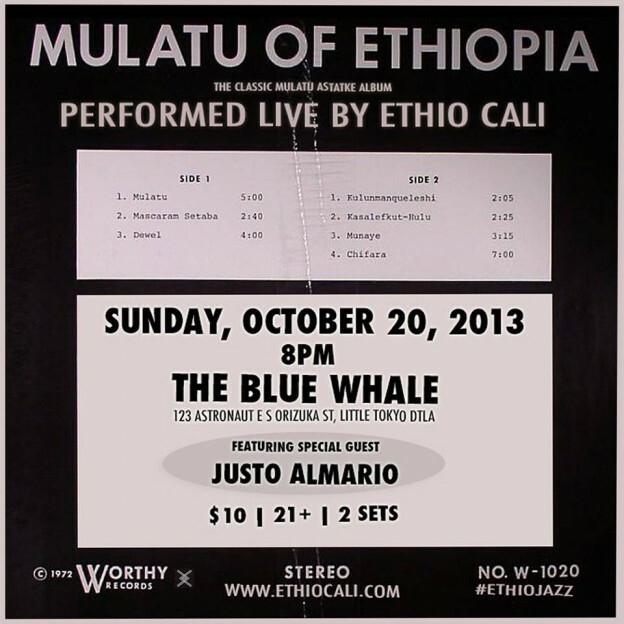 Todd M. Simon’s Ethio Cali invites you to the blue whale this Sunday, October 20, 2013 at 8pm to its performance of the entire 1972 classic ‘Mulatu of Ethiopia’ by iconic Ethio Jazz composer and musician Mulatu Astatke. The concert features saxophonist Justo Almario, one of the original musicians on the album as well as an introduction by musicologist/producer DJ Carlos Niño. The band features Todd M. Simon, Randal Fisher, Alan Mark Lightner on vibraphones, Damon Aaron, Patrick Bailey, Steve Haney, Te’Amir Yohannes Sweeney, Mark Cross, Dexter Story and is co-curated by Sonny Abegaze. Doors open at 8pm. Cover is $10.